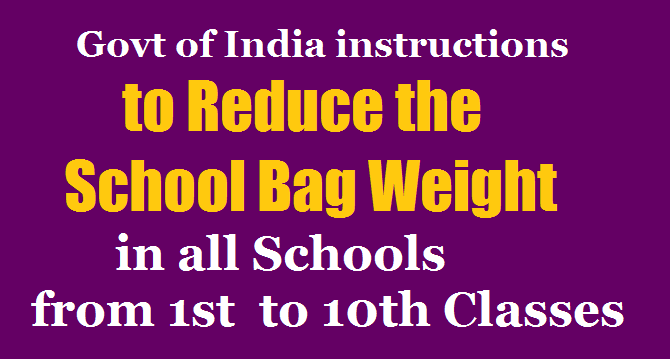 Govt of India instructions to Reduce the School Bag Weight in all Schools from 1st to 10th Classes, class wise weight Limit here. Govt of India MHRD instructions to Reduce the Weight of School Bag in all Schools. Reducing the Weight of School Bag in all Schools and given maximum weight limit for each class of Primary, Upper Primary, Higher sections. Govt. of India Directorate of Education F.No 65/18/2017 Edn Dated: 20/ 11/2018 OFFICE CIRCULAR Sub: The Department of Education- Additional Subjects/Weight of School Bag-Instructions issued. 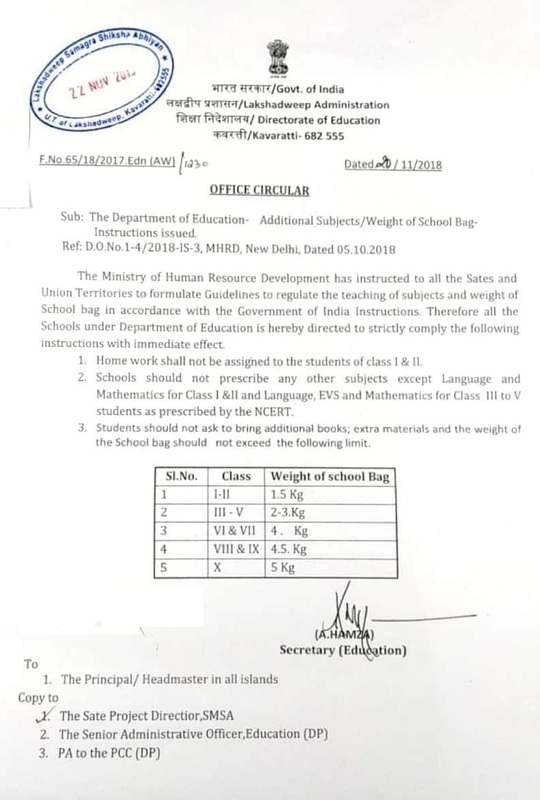 Ref: D.O.No.1-4/2018-IS-3, MHRD, New Delhi, Dated 05.10.2018 The Ministry of Human Resource Development has instructed to all the Sates and Union Territories to formulate Guidelines to regulate the teaching of subjects and weight of School bag in accordance with the Government of India Instructions. Therefore all the Schools under Department of Education is hereby directed to strictly comply the following instructions with immediate effect. 1. Home work shall not be assigned to the students of class I & II. 2. Schools should not prescribe any other subjects except Language and Mathematics for Class I &II and Language, EVS and Mathematics for Class 111 10 V students as prescribed by the NCERT. 3. Students should not ask to bring additional books; extra materials and the weight of the School bag should not exceed the following limit.